We're excited that word is getting out about this great project. Please help us spread the news! Post/share this on Facebook, through email, etc. Let's spread the word to help more women find their freedom! We were privileged to be interviewed by Sayare Television while in Chemase, Kenya at the school distributions. This was a great opportunity to spread the word in Kenya ~ Thank you, Sayare! West Michigan Woman Magazine published a profile interview with Donna regarding the project underway for It's Our Mission:Period! Donna spent some time with Erika Fifelski, West Michigan Woman magazine's editorial coordinator last week and Erika put together this great article. Thank so much Erika for believing in the project and helping us get the word out! To read the article in its entirety, click on the photo to the left. Jennifer Ackerman Haywood highlighted the project in a recent craft segment at Channel 13 WZZM, Grand Rapids, Michigan. It's Our Mission. Period! 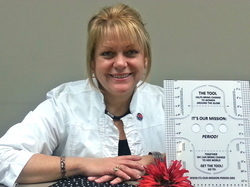 is a project led by Donna Terpstra, a mother, missionary and co-founder of Coopersville-based It's Our Mission: Period! Terpstra is working with her husband, Jon, and an army of West Michigan volunteers to empower young women in Kenya. Terpstra's charity effort enlists volunteers to sew washable feminine hygiene products for middle school girls in Kenya. Jennifer Ackerman Haywood has written about the effort and shows viewers how they can get involved. The problem is that girls in Kenya don't have access to mass produced feminine hygiene products and often have to miss a week of school during their periods. West Michigan crafters are doing their part to get the girls the supplies they need to feel empowered, embrace their womanhood and go about their lives without interruption. Click on the picture above to view this video and complete story! Special thanks to Jennifer, for supporting this great cause. Now consider this: Many African girls do not have access to underwear — let alone the appropriate feminine hygiene products. As a result, the young girls use rags, leaves, toilet paper or, in some cases, nothing at all during menstruation. And because these methods are not reliable, young girls routinely skip school for several days every month to avoid embarrassment. This means a teenage school girl could miss more than 150 days of high school. And for many girls, education is their only ticket to advancement. Amen, sister! (Click on the picture to the left to read the article in its entirety.